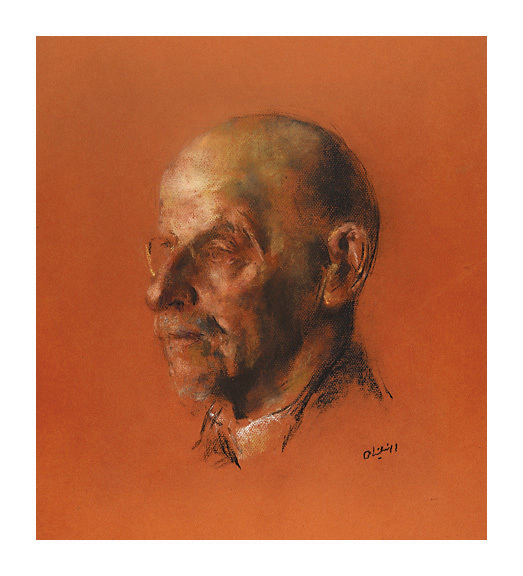 Portrait of an Elderly Man- - c.1925, Color Pastel. Image size 12 1/2 x 8 1/2 inches (318 x 216 mm); sheet size 18 1/8 x 15 1/2 inches (460 x 394 mm). 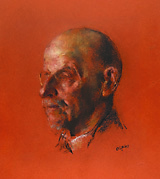 A fine impressionist rendering, on rust wove drawing paper. A repaired tear in the center left sheet edge, well away from the image, otherwise in excellent condition. 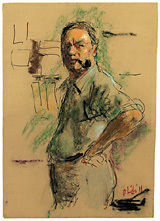 From the artist’s personal portfolio. 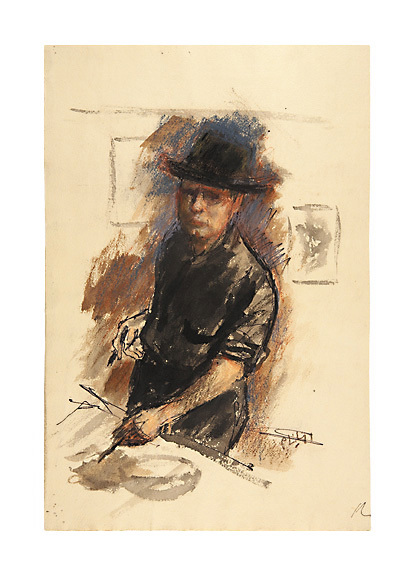 Self-Portrait with Black Hat- - c.1945, Ink and Color Pastel. Image size 16 1/4 x 11 1/4 inches (413 x 286 mm); sheet size 19 1/4 x 12 3/4 inches (489 x 324 mm). A fine, spontaneous drawing, on heavy buff wove paper; tack holes in the top and bottom left sheet corners, minor rippling in the bottom sheet edge; otherwise in good condition. From the artist’s personal portfolio. 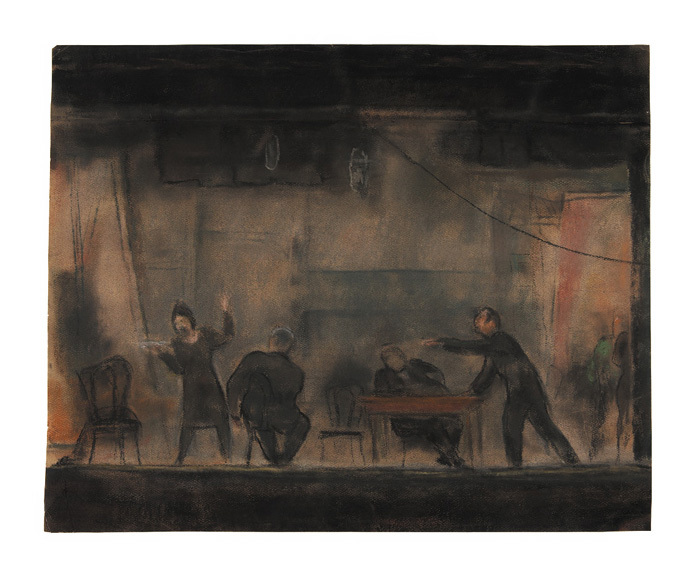 Rehearsal, "Long Day's Journey into Night"- - c.1957, Color Pastel. Image and sheet sizes 17 1/2 x 21 3/4 inches (394 x 305 mm). 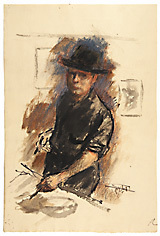 A fine, atmospheric rendering, on warm gray charcoal paper; a repaired tear (1/2 inch) across the bottom left sheet corner; otherwise in excellent condition. 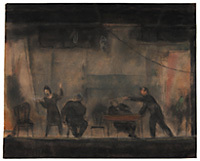 From the artist’s personal portfolio. 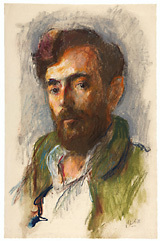 Portrait of a Young Man- - c.1967, Color Pastel with Wet Brush. Image size 19 x 11 1/2 inches (483 x 292 mm); sheet size 19 x 12 3/8 inches (483 x 314 mm). 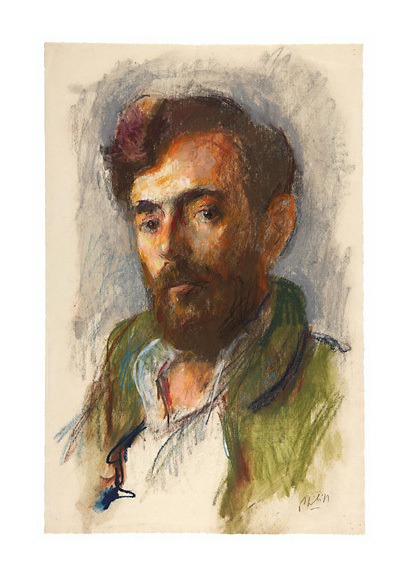 A fine, painterly drawing, on cream laid Michallet drawing paper. Tack holes in the four sheet corners, otherwise in good condition. From the artist’s personal portfolio. 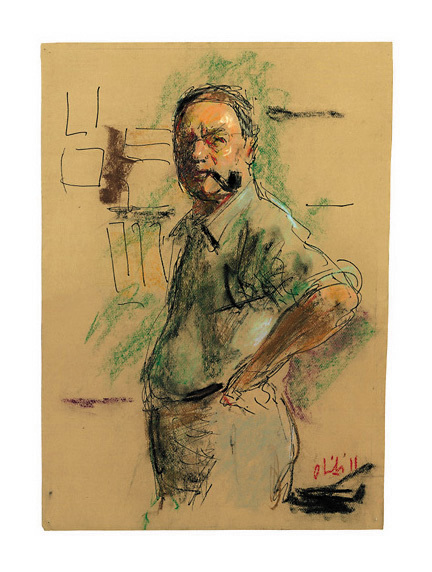 Self-Portrait with Pipe- - c.1975, Ink and Color Pastel. Signed in red pastel, lower right. Sheet size 19 1/8 x 14 3/8 inches (486 x 365 mm). A fine, spontaneous drawing, on heavy buff wove paper; tack holes in all four sheet corners, otherwise in excellent condition.